Kellyanne Conway’s comments will make the Liberal’s eyes pop out and their ears bleed! Democrats hate our veterans, military, and cops. This was clearly shown when a true American hero Chris Kyle was murdered. Chris saved countless America soldiers by taking out Islamic Terrorists and was vilified by the left. Liberals even attacked his widow Taya. 100%FedUp: Democrats have spent the last couple days whining to their liberal allies in the media about the repeal of the disastrous Obamacare. Their goal is to make Republicans look like the bad guys for attempting to dismantle and replace the unconstitutional and very unpopular health care mandate that was fully supported and endorsed by every Democrat in Congress. Kellyanne Conway appeared on the Sean Hannity show with guest host Eric Bolling. She was clearly frustrated by the Democrats attempt to mischaracterize the repeal of Obamacare. 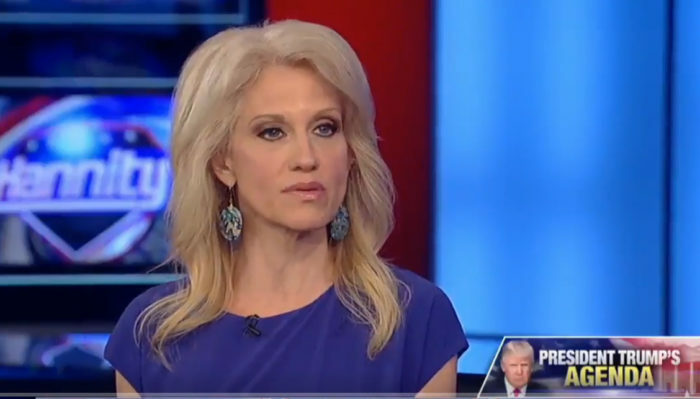 The outspoken Kellyanne Conway blasted the Democrats, asking Eric Bolling, “Where the hell were the Democrats when veterans were dying?” She also reminded Bolling that President Trump signed the Veterans Choice Act last week, allowing veterans who can’t get timely, quality health care at a VA facility, to access the private health care system. By the way, when is the last time the American taxpayer saw a $1 trillion tax cut? No wonder the Democrats are panicking! The American Health Care Act (HR 1628) passed by the House this week reduces taxes on the American people by over $1 trillion. For a list of taxes the bill abolishes that were imposed by Obama and the Democrat party in 2010 as part of Obamacare click HERE.